Storms, fires, floods, and heat caused unprecedented destruction in 2017. Why? 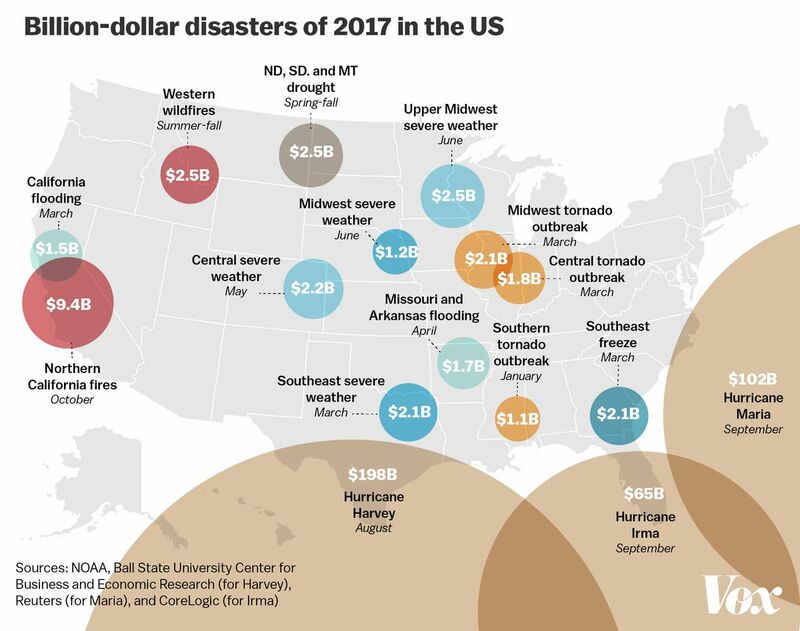 2017 is about to become the most expensive disaster year in US history, costing nearly $400 billion in damages. California was drenched in the wettest winter on record, ending years of drought. Then came California’s most destructive and largest wildfire season ever. The Tubbs Fire in Northern California killed 22 people and damaged more than 5,600 structures. Hurricane Harvey broke a rainfall record for a single tropical storm with more than 4 feet of rain. Puerto Rico is still mired in the longest blackout in US history after Hurricane Maria struck three months ago. More than 1,000 are estimated to have died in the storm and its aftermath. San Francisco reported its hottest temperature ever, 106 degrees Fahrenheit, while other parts of the country set records for high-temperature streaks. 14 places across Oklahoma, Missouri, and Arkansas reported record-high water levelsduring floods in April and May. Requests for federal disaster aid jumped tenfold compared to 2016, with 4.7 million people registering with the Federal Emergency Management Agency. Yet we must see 2017 as an average year, if not a baseline. We must reckon with the likelihood of even worse storms, heat waves, fires, and droughts as the Earth warms — because scientists expect even this “new normal” to get worse. The reasons for this are many: As the climate changes, the US is becoming much more vulnerable to disasters. People keep flocking to live in places we know are likely to be hit. And our policies don’t protect them, not by a long shot. Here are some of the lessons we’ve learned from 2017, and what they suggest for how to prepare for future catastrophes. Climate scientists have been warning about extreme weather, that it would become more frequent and intense in new ways. Yet 2017 still seemed like a brutal wake-up call to nature’s extraordinary power, and the frightening possibilities of this warmer world. There’s still a lot we don’t know about why some weather is so extreme and how much climate change is to blame (especially when it comes to hurricanes). But 2017 gave us more clues about what we can expect in the world to come, hints that hopefully will help us prepare for the future. This is what we understand about the connections between climate change and the disasters we saw this year. The year started off with torrential rainfall in California, marking the wettest winter in a century. Parched after years of drought, the rainfall officially brought the dry spell to an end as floods inundated hundreds of homes, landslides buried roads, and high water levels threatened to burst dams. Flooding across Missouri and Arkansas in the spring also claimed 20 lives and carried a $1.7 billion price tag. 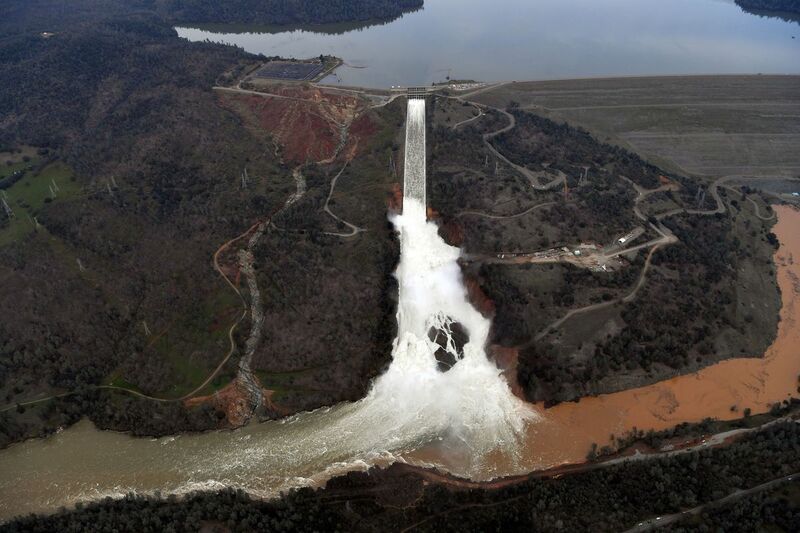 California’s Oroville Dam suffered damage to its spillway after record rainfall, forcing almost 200,000 people to evacuate. Rainfall, both the amount and the rate, represents one of the strongest signals of climate change. Warmer air increases the evaporation rate of water, and for every degree Celsius increase in temperature, a parcel of air can hold 7 percent more water. Average annual rainfall across the United States has gone up by 5 percent since 1990, though there’s regional variation, according to the National Climate Assessment. Scientists have found that the amount of rain dished out by heavy rainstorms has gone up 10 percent since 1900 due to global warming. Extreme rainfall events are trending upward, and nine of the top 10 years for extreme one-day precipitation events have happened since 1990. And all this moisture-laden air helped drive the powerful hurricanes that made landfall in the United States. “Hurricanes live and die by the amount of rainfall they make out of moisture,” George Huffman, a research meteorologist at NASA Goddard Space Flight Center, told Vox. 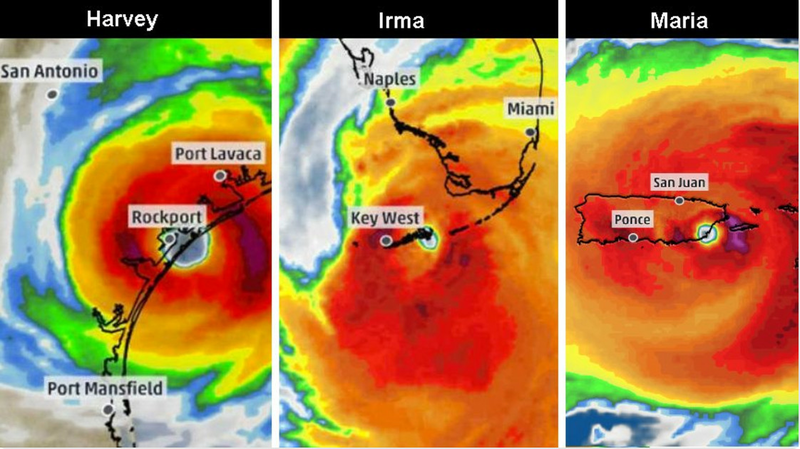 The three biggest hurricanes of 2017 making landfall in the US. “To say this hurricane season has been historic is an understatement,” FEMA Administrator Brock Long told Congress in October. Harvey, Irma, and Maria all made landfall as powerful Category 4 storms with winds exceeding 130 mph. Harvey in particular dumped a truly staggering amount of rain over Houston. The estimated 24 trillion gallons that fell there was so heavy it actually depressedthe earth more than half an inch in some spots, according to preliminary analysis from the Scripps Institution of Oceanography. These are the types of storms climate scientists expect to see more of in a warmer world. 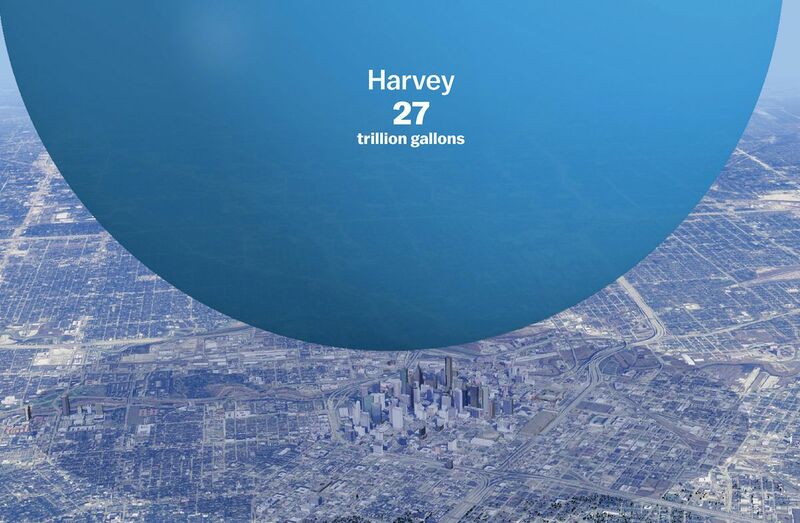 Hurricane Harvey dumped somewhere between 24 and 34 trillion gallons on Texas and Louisiana. First off, yes: There’s consensus that the science of climate change predicts that in a warming world, hurricanes will become more intense, carry more rain, and cause worse coastal flooding linked in part to sea level rise. But here’s the thing: We don’t yet currently know, conclusively, that the hurricane season as a whole represents a result of climate change. “At this point it’s really uncertain if there’s any detectable human influence on any hurricane or tropical cyclone metric,” Tom Knutson, an NOAA meteorologist who studies hurricanes, told Vox in October. While it’s hard to say if the punishing number and intensity of storms were due to climate change, climate scientists have now determined — in two separate research efforts — that Hurricane Harvey’s record-blasting rains (best measured in feet for much of Houston) were likely amplified by climate change. “Human-induced climate change likely increased Harvey’s total rainfall around Houston by at least 19 percent, with a best estimate of 37 percent,” Michael Wehner, a co-author on an attribution study recently published in Geophysical Research Letters, said at the American Geophysical Union conference in December. And the corresponding study in Environmental Research Letters concluded that climate change increased flooding by around 15 percent. 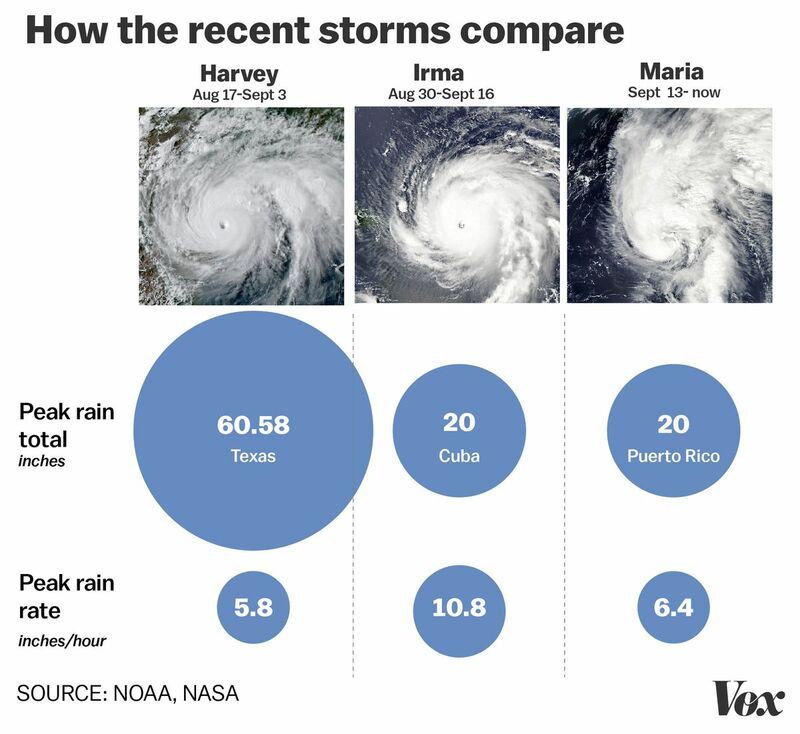 What’s still not known: Did climate change alter the odds of seeing three incredibly strong storms — Harvey, Irma, Maria — in a row this season? In June, the Western US experienced the most intense heat wave ever to strike so early in the year, leading to dozens of flight cancellations. On June 21, Ocotillo Wells, California, reported a temperature of 124 degrees Fahrenheit, the hottest reading ever in San Diego County. A map of how much higher temperatures were this year relative to the average between 1895 and 2017. Farther north, Olympia, Washington, set a June temperature record of 98 degrees Fahrenheit. The searing heat persisted throughout July in the Pacific Northwest, and was followed by another wave in October, as high temperatures rippled through the Midwest and reached triple digits around Los Angeles, shattering records. One of the biggest factors in this year’s record wildfire season was, oddly, rainfall. Vegetation across much of the drought-stricken west eagerly soaked up the surfeit of water from the wet winter, leading to a rapid, vast growth spurt in trees, grasses, and shrubs in the spring. Then summer and fall brought intense heat that dried out these plants, turning the greenery into fuel. Wildfires began igniting over the summer, sending choking air pollution through Washington, Oregon, Idaho, Montana, and California. Huge new fires appeared in subsequent months, causing record damage, including the ongoing fires around Los Angeles that are poised to burn the rest of the year. The Thomas Fire in Santa Barbara and Ventura counties, at more than 280,000 acres, is the largest fire in California history. Across the United States, more than 9.5 million acres have burned to date, making 2017 the second-worst year for fires in terms of area. 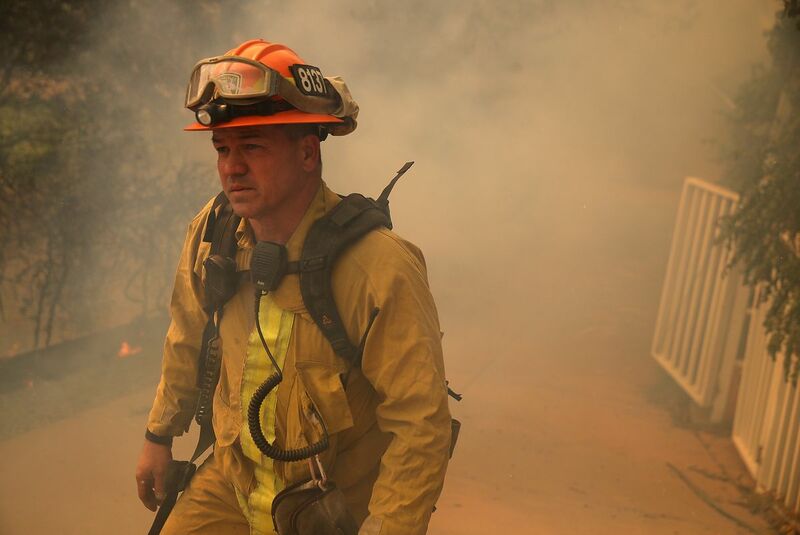 A Los Angeles County firefighter monitors approaching flames on October 9. But the wildfires that scorched vast swaths of the US this year can scarcely be described as natural disasters, since human activities exacerbated them at every step. And changes in the climate are making many of these wildfires worse. Researchers found that human-caused climate change accounts for 55 percent of the increase in drying out of Western forests, a major factor in wildfires, and has led to a doubling of the area burned. 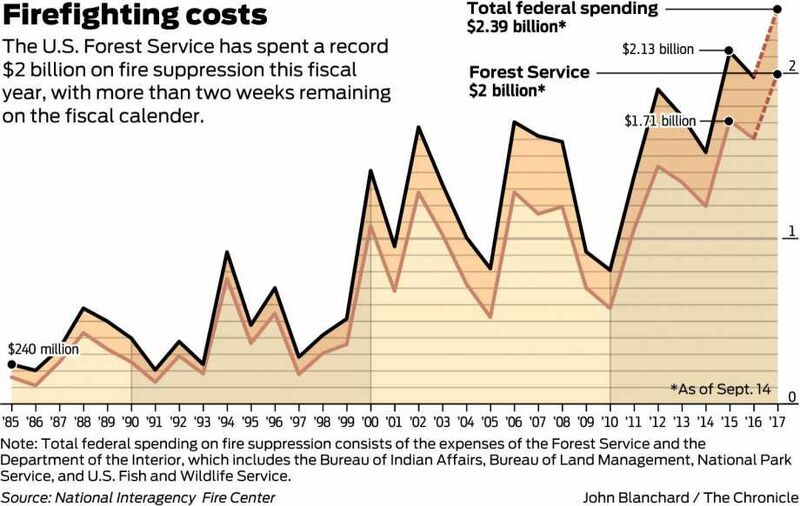 Fire suppression costs are on the rise. But as with hurricanes, there is some nuance to climate’s role in wildfires. Rising temperatures and less precipitation have had a bigger effect on fire risk in a temperate region like Northern California but has less of an impact in an area that’s already hot and dry, like Los Angeles County. At the moment, scientists say they haven’t detected a climate signal in fire patterns in this region. 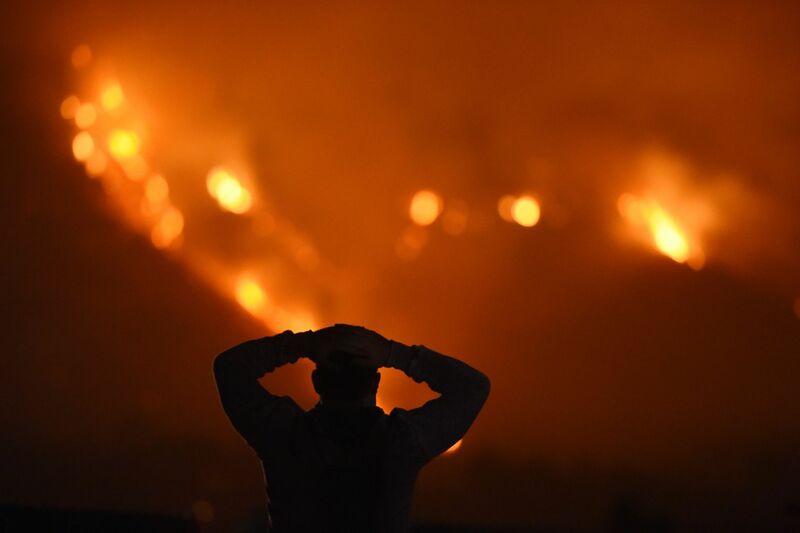 But in study published in Environmental Research Letters in 2015, researchers projected that the area scorched by wildfires in Southern California will grow by as much as 77 percent by the middle of the century due to warming. 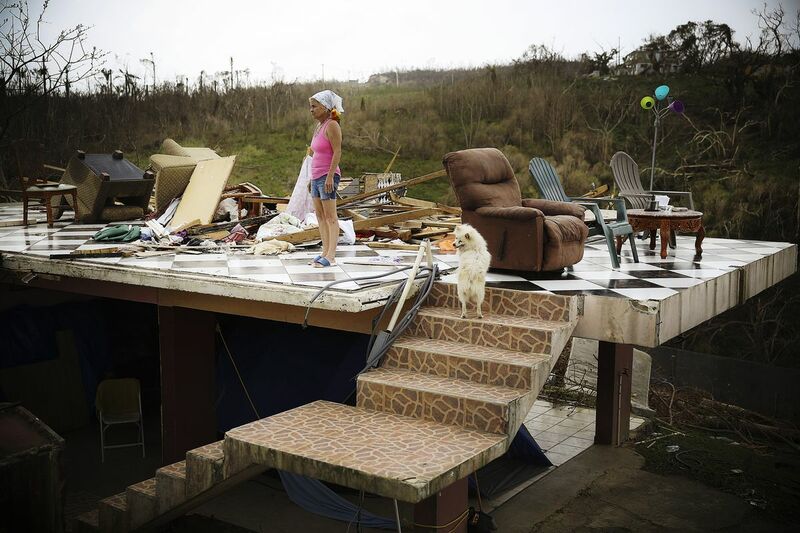 Irma Maldanado stands with Sussury, her parrot, and her dog in what is left of her home in Corozal, Puerto Rico, on September 27. Worldwide, 2017 is shaping up to be the most expensive year for climate disasters ever. In the US, it’s already the most costly year ever for hurricanes and for wildfires. Such expensive weather events are part of an ongoing trend. Since 1980, there have been 218 disasters across the United States with costs topping $1 billion. The Congressional Research Service reported earlier this year that inflation-adjusted disaster appropriations have shot up 46 percent from a median of $6.2 billion between 2000 and 2006 to $9.1 billion between 2007 and 2013. And the price of disaster damage is continuing to go up, according to the Government Accountability Office. Part of it is that the hurricanes this year really were immense, but they have a bigger impact when they collide with growing cities. As more people compete for real estate, property values have skyrocketed in Florida and California. That means any time a disaster strikes, it becomes horrendously expensive to repair all the infrastructure and personal property. But it’s still difficult to tabulate the costs of the storms. Many of the dollar values are drawn from insured properties, which represent only a fraction of the devastation. Over the past decade, only 30 percent of catastrophic losses around the world were insured, according to the reinsurance firm Swiss Re. That leaves a gap of $1.7 trillion in uninsured damages. And for a place like Puerto Rico, still mired in blackout, the estimated $95 billion it will cost to rebuild doesn’t really convey all the suffering caused by the storm. About 43 percent of the island’s 3.3 million residents live below the poverty line, so the dollar amount of the damage may be lower than for places like Houston, Texas, with large homes and expensive industrial facilities. Now the big question is who pays the bill. FEMA has offered more than $3.3 billion in aid to disaster victims through its Individuals and Households Program and $1.4 billion in public assistance this year. But it’s crunched for cash, as the huge storms and fires have depleted its reserves. An $81 billion emergency disaster relief package for Puerto Rico, Texas, Florida, and California is likely to languish for weeks as Congress leaves for the holidays. The disasters of 2017 took hundreds of lives. Hurricane Maria was especially cruel, with estimates of more than 1,000 deaths in Puerto Rico. Hurricane Harvey was responsible for taking 82 lives. The Tubbs Fire in Northern California killed 22 people. There were at least six deaths attributed to heat waves this year. Yet the toll of storms, fires, floods, and heat on human health can also be more insidious and can linger for years. Heat is rarely listed as a cause of death, but it can be a factor in heart attacks, strokes, and respiratory arrests. High temperatures also worsen deadly air pollutants like ozone, which is linked to respiratory illnesses such as asthma. Smoke inhalation from wildfires can also be deadly over time, since fine smoke particles in the air aggravate asthma, provoke inflammation, and strain the heart and lungs. When concentrations of very small particles of wood smoke pollution (smaller than 2.5 microns, a.k.a. “PM 2.5”) reach above 10 micrograms per cubic meter, researchers find a 7 percent increase in asthma inhaler refills. “But if there’s a 100 microgram per meter smoke day, we’d expect that to go to a 100 percent increase of inhaler refills for the population,” Katelyn O’Dell, who studies the health hazards of wildfire smoke at Colorado state university said. 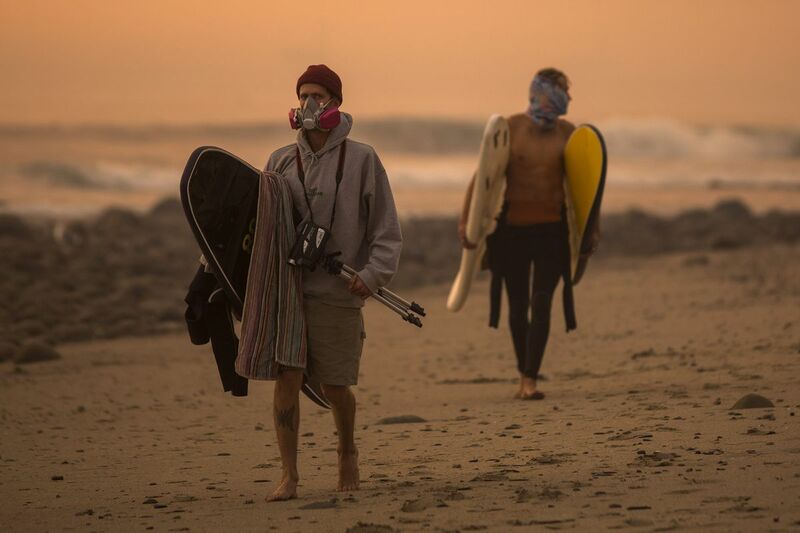 Many of the wildfires this past year created conditions that exceeded this level of pollution. Researchers expect that as climate change makes wildfires more likely over the course of this century, deaths and illnesses attributed to pollution from wood smoke will rise too, even offsetting gains made from cleaning up emissions from industry. And the fury of a hurricane can leave people scraped, bruised, crushed, or drowned. When a storm cuts off electricity, other dangers abound. “Just about every interaction with the health system now involves electricity, from calling a hospital for help to accessing electronic medical records and powering lifesaving equipment like hemodialysis machines or ventilators,” Vox’s Julia Belluz wrote in the wake of Hurricane Maria. Smoke from the Thomas Fire on December 12 in Carpinteria, California. Disasters are a strain not just on physical health but on mental health as well. “Expect a burden of mental health problems, which will include depression, post-traumatic stress disorder, and it’s particularly going to impact groups who don’t have access to rapid opportunities for recovery,” Sandro Galea, dean of the Boston University School of Public Health, told Vox after Hurricane Harvey hit Texas. “We all have a threshold that if we watch a loved one swept away in rushing water and drown, that can definitely create post-traumatic stress disorder,” Charles Benight, who studies trauma at the University of Colorado, said during the peak of the hurricane season. We’ve always been vulnerable to natural disasters. But now the climate is changing. There are few signs at the local or federal level that policymakers are taking the risks of climate change and extreme weather seriously, and some forces are even exacerbating the risk. Engineers have long known that Houston is especially prone to flooding, yet land developers have acted as though the risk is nonexistent for decades. Future development will need to reckon with a need for better drainage. We have no system to deal with escalating climate damages. It’s time to build one. As sea levels rise and disaster risks to coastal communities grow, some planners are broaching the idea of a “strategic retreat” from areas that face persistent floods and fires. And based on projections showing these events happening over and over, we should be saving up money to rebuild when these disasters happen again. 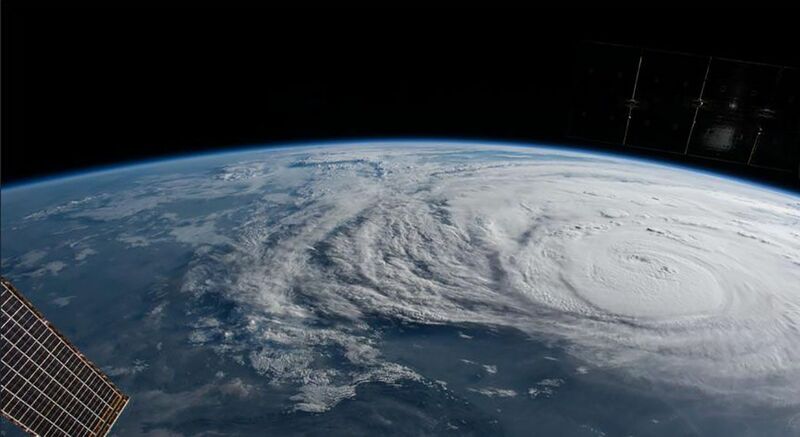 The International Space Station orbited over Hurricane Harvey and photographed the storm bearing down on the Texas coast. Instead, programs like the federal government’s National Flood Insurance Program, which helps homeowners pay for damage from floods, ends up encouraging people to rebuild in areas that are likely to get flooded again. In one egregious case, a Houston home valued at $115,000 flooded 18 times in 16 years, costing the government $800,000. We see similar problems with fire insurance in California, which lets homeowners rebuild a torched home, though some insurers are dropping homeowners in high fire risk areas. And as insurance rates rise, fewer people are buying insurance at all, which ends up passing recovery costs to the federal government. Meanwhile, the Stafford Act limits federal reconstruction efforts to restoring the status quo ante. That means for a place like Puerto Rico, whose energy infrastructure vulnerabilities were laid bare after Hurricane Maria, there isn’t much room in the budget to make power lines, generators, and transformers more resistant to future disasters. Even without the threat of climate change, we’ve long known that hurricanes are dangerous. They’ve inflicted grave damage on coastal communities for as long as we’ve had them. Louisiana has long been notorious for flooding, and Arizona renowned for triple-digit heat, and wildfires have always been an iconic part of the American West. So larger hurricanes are coming. More wildfires will ignite. Longer heat waves will sear. And other climate disasters are likely grow bigger, more intense, more expensive, and more frequent. We see them on the horizon. And we need to start preparing now.